so it has been decided that the relay is not needed correct? pump just wires to power, ground, and terminal 8 at ecu? How do the ecu values affect the valve closing/opening using the volvo pump? The volvo pump acts faster than the oem setup? 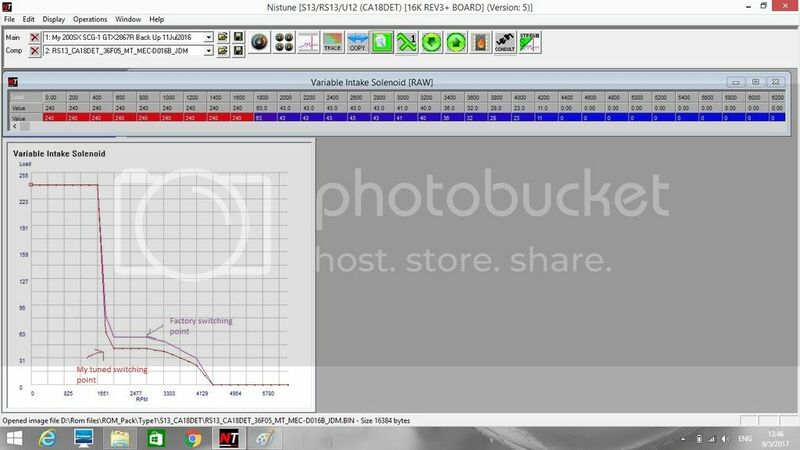 Checking the ecu values using nistune it goes from 240 to 0, I have the stock butterfly settings. Would it work better if you set all values to 240 where you want it closed and then 0 when you want it open? ie up to 4000 rpms with a 240 value and the above that 0...or leave it stock going from 240...going down to 0 in steps? Very few people have altered those settings, and none have come back here to share their experiences. Have a go at them and let us know what you find out!!! Here is the compare of my tuned butterfly solenoid switching point to the factory switching point. Tune was done refer to the load / flow , due to my hardware setup have bigger AFM and bigger injectors, the calculated switching point will switch at lower load point, but actually it maintained the same flow as factory switching point . Last edited by louiswun on Mon May 08, 2017 11:20 pm, edited 1 time in total. The main difference is between load point 31 to 63, it is where my setup go into boost . For my hardware setup, load point 32 is where I begin to see boost from 0 psi gauge pressure, but at the same gauge pressure in factory setup, the load point is in 42. In my tune, the solenoid will switch on (to ambient pressure, butterfly open) at around 3,600 rpm at "X" flow. if I maintain factory switch point in my hardware setup, it will switch at 4,200 rpm at the same flow rate. Usually the hardware (AFM and injectors) have capable of bigger flow rate, the load point will be lower / smaller. The more flow capable compare to factory hardware, the more load point it will throw off. if switching point is not tuned, the butterfly will delay in switching, the actual drive feeling is somewhat like a honda vtec kick in, the torque will suddenly increase , some torque lost before switching, feel flat but suddenly alive. if switch point is tuned, the whole switch thing cannot be feel, the torque will smoothly increase without suddenly change, no flat spot, feels like more torque at 3,500 rpm to 4,500 rpm. The switching point tune is only need to do between 1,800 rpm to 4,200 rpm. And I did NOT know that Nistune had a table for the variable intake. Has it always been there? No, it did not had that table in the very beginning, and they add it upon user request.